Another steal from Last Bottle Wines. A bit on the young side perhaps but I drank the first of the two bottles so lustfully, that I couldn’t wait to open the second — and make sure I got a tasting note in before it too disappeared. I should have bought a case. I did also buy a bottle of their 2010 La Fortuna Brunello, which I will be more responsible with. On this one, a deep, luscious nose of baked cherries, earth, and elegant oak — not at all overpowering of the other components rather in complete harmony. On the palate: moderate and integrated acidity and tannins with deep, soft cherry fruit and a lengthy and slightly toasty finish. Also completely in balance in taste. It’s drinking like a god right now, can only imagine it improving with age. Everything you need is there. Too bad this is the only other bottle I have. But the producer has just made my favorites list. Can’t wait for the Brunello, but I should. Around $25 a bottle, I think I paid $12 each. I give it 90 points. Score another for Michael David Winery. As I’m sure you can tell from the previous post, this one was on my radar as well. While on vacation last week in West Virginia, we went to a combination gallery/shop of local artisans’ work and wine shop recommended to us by a local park ranger. Another gem from the banner 2012 vintage in California, this one had a nose of deep black fruit including plum and currants, and obvious but not overpowering oak. The palate continued the deep black fruit and oak notes, with the addition of tobacco and cigar-box nods as well. Smooth but firm tannins and acidity were there but everything was well-balanced and this could last at least 5 years, if not more. It was very tasty and went over well with the pulled pork and ribs of our authentic southern feast. Parker gave it 90 points, and I’m on board with that. My family enjoyed it as well, and it didn’t last past dinner, as any good wine shouldn’t. Now that I have this new briefs section of the site, I will kick it off with by mentioning this great wine. I’ve been meaning to tell you all for a while how much I enjoyed it. Drinking it was a tasty culmination of much ado among family, friends, and customers about Michael David wines. My dad’s a tough nut to crack when it comes to wine. When I asked what he did like, he said Seven Deadly Zins first. Then I had a customer rave about many of their wines, one of which was this lovely Petite Sirah. Coincidentally my daughter’s boyfriend’s father is a huge wine enthusiast and after I gifted him some favorite wines last Christmas, he shared a bottle of one of his favorites, which just happened to be this wine. Following all this fuss I not only extensively researched this favorite winemaker for my own curiosity’s sake, but also opened the bottle post-haste. Tasty, tasty stuff. Mostly PS with a bit of Cab in the blend. Lots of black fruit to balance the tannins and ready to drink. 2012 was a great year in California. Will have to pick up more, but this time I will have to pay for it! He has many wines including the enticingly-named “Lust”, “Freakshow”, “Rapture”, “Sloth”, “Rage”, “6th Sense Syrah,” “Petite/Petit”, and of course “7 Deadly Zins”, which is the ‘gateway red,’ to their wines, as my customer put it. Not in any derogatory way whatsoever though. Only that this is the most well known and accesable of the Michael David wines, and a fan would soon find their way to the others. More info on the this wine here. The ratings are very kind to it as well, but taste and decide for yourself. It’s about $24. Over my kids’ spring break in April we made our annual family trip to visit my wife’s parents in Miami. This time we also got to experience a wine and food tasting, thanks to my father-in-law who got us a pair of VIP tickets, for which we were very grateful indeed. Usually we take a few days of the week to head off on our own to places like the Everglades or the Keys or the Gulf Coast. But this year we spent the whole week in the Miami area so this made it possible to include this in our plans. 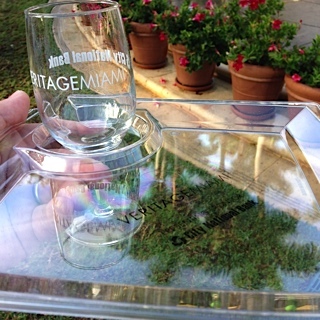 The “Veritage” (formerly United Way Miami Wine & Food Festival) Fine Wine tasting was held at the Village of Merrick Park in Coral Gables, just a stone’s throw from their house. There were also some spirits there, but we did not try them as I was focused on the wine, of course! 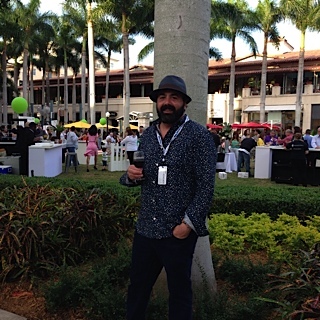 The festival also includes a legal mingle wine tasting, an interactive dinner with chefs, a craft beer tasting and an auction/wine dinner at other locations which we did not attend. So this review is just my experience at the wine tasting portion. Let’s get right down to the nitty-gritty. I’m going to do most of this in list fashion so that you don’t have to read 12 pages, and let’s be honest, I was busy enjoying the experience, not taking long notes on every sip. Plus, if I had done that, I’d have missed out on a lot of the enjoyment of it. Maybe when someone is paying me to report on it I will think differently on that matter! Food Favorites: My top tables were Buns and Buns, BLT Prime and Misha’s Cupcakes to top it off. I admit my curiosity for Buns and Buns was piqued by one attendee’s comment to another: “You’re not going to get better food than at this table.” So I waited in line and it was worth it. Amazing pork buns, and BLT had amazing brisket. And who can resist Misha’s cupcakes? We couldn’t! We even brought some home. 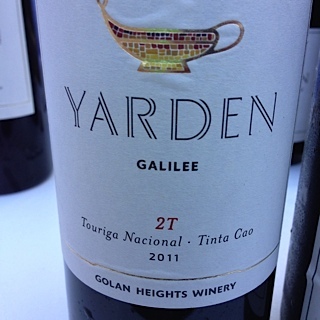 Wine Favorites: I was really impressed by the Israeli wines. I know they’ve been making wine for millennia, even if most don’t think of it as a top region. The variety of grapes and styles was also impressive. 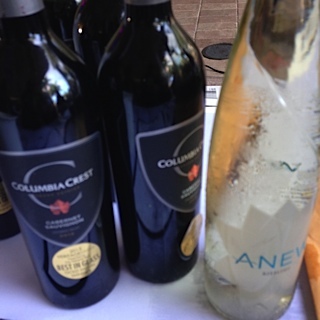 Favorites were the Portuguese-style Touriga blend and the Sauvignon Blanc. Also, a few producers whose wines I work with were there, so it was a treat to taste some of their wines that were new to me. Chateau Ste Michelle from Washington were also there with two wines from their collective of wineries — Columbia Crest and Anew, representing some of their best Cabernets and Rieslings. Though their rep was MIA for most of the VIP hour, that was nothing a little self-pouring couldn’t remedy! 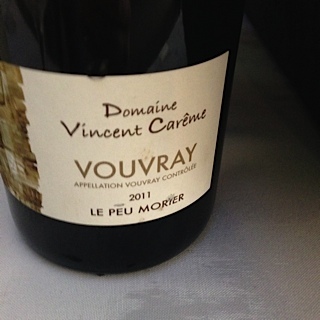 I Also loved the ‘Boneshaker” Lodi Zinfandel, the Domaine Vincent Careme Vouvray (they had another Vouvray there with a higher profile but this one stood out as it was more more unique and complex) and the Nardi Brunello. The Glass/Tray combo: Loved the food tray with the integrated glass holder. Both were plastic, for no-break convenience. Social media screen: Yours truly’s tweet showed up seconds after I posted. Very interactive and 2015! Bathrooms: Where were they? No one we asked seemed to know. While there were many restaurants in the courtyard, I doubt any or many had an open-door policy. Maybe they mentioned it to other guests at registration, but not us. We were among the earliest guests so its possible that’s why. More below on the registration desk questions. Seating: More would have been appreciated. Plenty of nice restaurants here had many open tables while large crowds of guests had to negotiate the aisles with food and wine in hand, post VIP-time. This is something they need to work out, in my opinion. Perhaps work with one or two of the restaurants to provide extra seating. There were also a few spots in the park I saw off to the sides that could have fit 20+ tables for guests, but was not utilized to alleviate the crowding. When people are drinking, and eating, and especially for handicapped or older guests, this is a must. It may not be the majority of the crowd, but it should be a consideration. Park benches and edging comprised of the seating we could find. Wine placement: I was excited to see a few of my favorite wineries on the list. Only it took me over 20 minutes to track them down, which entailed asking pourers at other tables who happened to be able to find them on a map in a piece of literature. Was this passed out at registration too? I don’t know. As a VIP, we were given passes but not the nice tote that later non-VIP guests seemed to have received, which I am guessing contained that booklet. Maybe this was also just a factor of being there precisely at the VIP hour kick-off, they weren’t entirely ready yet. I think, if you’re not ready with everything yet, don’t let guests in, even VIPs, until you are. I feel some of these details were missed for us and the other earliest arrivals. Registration: We were dropped off at one of 3 street entrances into the mall/park area, walked past tables being set up in that corridor and looked for the registration area once inside. It took a while to find, and we had to ask. Its possible that we were supposed to come through that main building entrance, but we got dropped off by my wife’s mother on this side street to get around the car traffic. So this is possibly why it was harder to locate. There were police at this entrance but they did not redirect us to another entrance or forbid our entrance here. Perhaps they thought we were staff. But I imagine we were not alone. Seeing as there are these 3 other street (vs building) entrances, they could have posted a volunteer, or at least a sign at each indicating the direction to/location of the registration area. All that considered, I only hope the feedback of this one attendee will help them improve a great event. I really enjoyed it and I don’t mean to sound overly critical. We have our own company tasting events and it’s nice to have others to compare it to and take away strengths and weaknesses and offer feedback that I can contribute to both, should they be interested in hearing it. 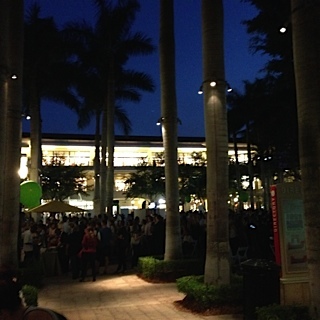 And, I got to enjoy some fantastic wine and food under the palms. Plus it all goes to benefit a good cause, which I am very glad for. 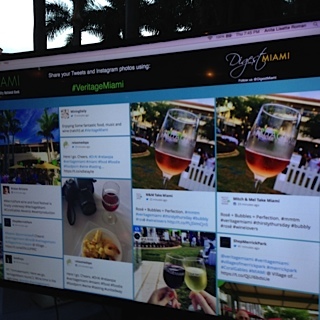 Cheers and thanks to Veritage 2015! A few weeks ago we went to celebrate our 5th anniversary in and around Harper’s Ferry, West Virginia. As history, hiking, and wine fanatics, this area had everything we wanted all in one spot. You may know Harper’s Ferry from the famous uprising of abolitionist John Brown, which would eventually lead to our nation’s civil war. We stayed in a bed and breakfast in nearby Charles Town that was built on George Washington’s first land purchased in the area. In fact, Charles Town was named for his brother. Our first morning we spent in historic Shepherdstown and then crossed the Potomac into Maryland for a visit to Antietam National Battlefield, rendered all the more somber and powerful from an overnight snowfall. And the state of Virginia is home to over 200 wineries, with a long history of vine cultivation, but we will get to that in a minute. With the unexpected weather we had opted to postpone our hike and winery visits until the next day when things would have melted off a bit. This was more for hike safety than for the winery visit, but nevertheless, 1,200 feet up on Loudoun Heights there was still several inches of snow to be found. After heading back down the Appalachian Trail route across the Shenandoah into downtown Harper’s Ferry, we hopped in the car to visit some of the nearby wineries of Northern Virginia. 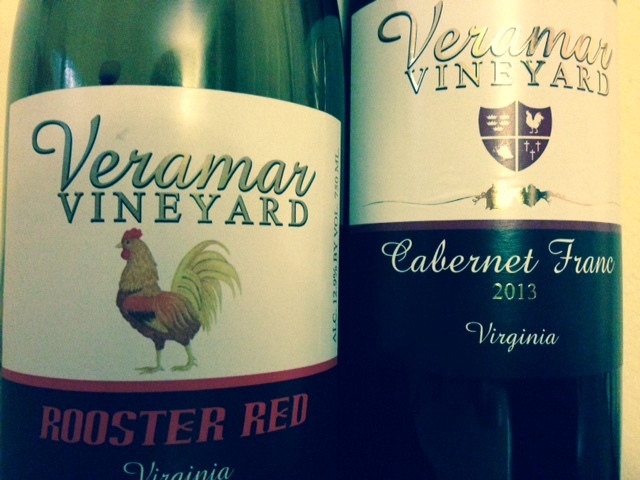 A friend of mine who lives in the area recommended Veramar winery in Berryville. In complete contrast to the snowy mountaintops, the sun was shining down on the rolling hills and vineyards of the seemingly endless estate, with the expanse of the Blue Ridge extending in the distance as far as the eye could see. 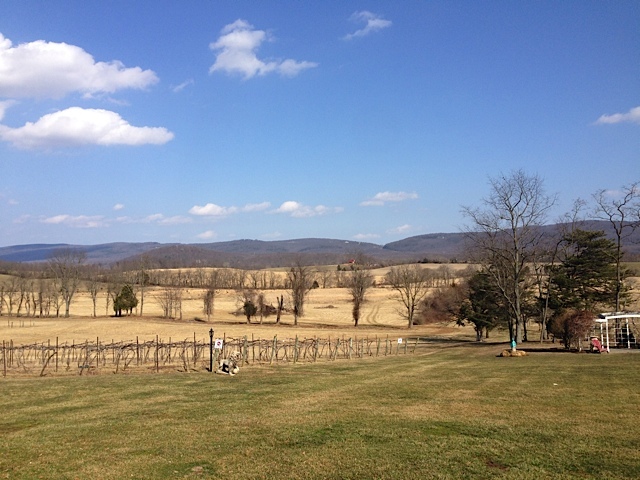 This area of the state’s wine industry is Shenandoah Valley AVA. Vine cultivation in Virginia goes back as far as the original Jamestown colony, and Thomas Jefferson himself was growing the first vinifera vines here at his home in Monticello. For more on that subject, read one of my favorite books, “Thomas Jefferson on Wine,” by John Hailman. On this beautiful day, the owner and family were enjoying the weather as well and it sounds like there will be another generation of winemakers in the family. The scenery here is one you could imagine not looking all that different 250 years ago. After the tasting we bought a bottle of the Cabernet Franc 2013 and ‘Rooster Red’ blend as well as a few whites we enjoyed, particularly the Seyval Blanc. I am writing this on day two for the bottle of Rooster Red I brought home, so that wine has opened up a bit since and really is showing well on the nose and palate. The Rooster Red is a red Bordeaux-style non-vintage blend. On the nose are black currant and a seductive smokey oak and baking spices along with distinct soil/earth notes — softer on the palate than yesterday for sure. Some fig in there, and coffee bean. It paired nicely with food yesterday and is standing on its own quite well today. It has a medal from the San Francisco Wine Awards as well as commendations from Decanter’s World Wine Awards and 83 points from Wine Enthusiast. I also bought a bottle of the 2013 Cabernet Franc. Like the Rooster Red, the oak on this wine and the aromas associated with it are really dialed in and integrated. I don’t think I noticed as much at the winery. Though maybe that was a result of all the visitors that day and us just relieved to finally be tasting after waiting 20 minutes for a bridal shower before us to make room at the tasting bar. I was impressed — these smell like some of the best from the west coast and Europe. It is rated at 87 points on the winery site, though I am unable to find the source. On the palate, this Cabernet Franc is a balanced, elegant wine with very little of the under-ripe or green notes I usually encounter in reds from our part of the country. We enjoyed some warm bread and a gouda as well which you can buy at the tasting bar. 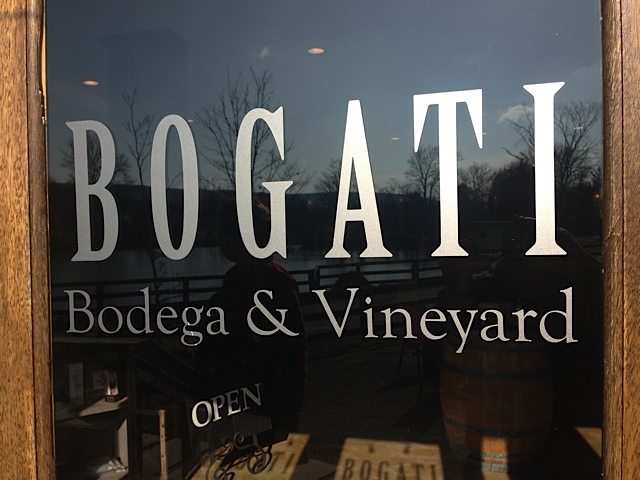 As we were looking over the options for one more stop in the region’s winery list, the staff suggested their sister winery just 7 miles down the road, Bogati.The Bogaty family runs Veramar, hence the name of their sister winery Bogati. (I am unsure of why the spelling was changed in the winery name – perhaps to be more chic?) When they told us it had a modern, Argentian flare, we decided it was defintely worth a visit. I had yet to come across a winery in this part of the country that did South American wines (or rather, a South American style of Malbec, a French native grape finding much success in Argentina of late.) A quick drive through a gap in the Mountains led us to Bogati. On the outside it looks like a modern art gallery space with some lovely views of its own. But inside it’s all about the wine, and plenty of style. Their wines have a few medals of their own, namingly for their Seyval Blanc, the light Pinot Gris-based wine known as “B-thin,” the “Tango Blu,” and their Malbec. The Malbec is really what I was excited about most though and it was a tasty and promising example. But equally as unexpected and unique as a Virginia Malbec, was their Touriga Nacional. You may know this as the principal grape of Portuguese red wines, and this one completely surprised and delighted me. As much for the uniqueness as the taste. If you’re in the neighborhood, stop by both of these fine wineries – they are each within an hour’s reach of Washington DC. Please forgive my less-than-consistent updates as of late — between the holidays and other commitments, free time has been scarce. Busy is good, I suppose. But I’ve been looking forward to writing about this wine, and I have a trip planned to a Virginia winery this weekend as well that I plan to share with you. Today I’d like to tell you about a fantastic Madiran wine given to me in a wine exchange with my manager at work. I traded her a lovely 2012 Russian River Pinot Noir (natch) and in return received this delicious wine. Madiran AOP is located just 35 miles north of the Pyrenees and 50 miles east of the Atlantic in Southwestern France. The combination of the steep mountainside vineyards and the Mediterranean climate help to ripen the grapes properly. Madiran wines wines are made from red grapes only and the rules require that at least 40% of the wine blend consist of the region’s primary grape Tannat, though some are actually 100% and this is also permitted, or rather not enforced. It is a very age-worthy wine style because of the concentrated fruit and substantial tannins (hence the origin of the grape’s name) but therefore also can be astringent and rough when younger. The addition of Bordeaux stars Cabernet Franc and Cabernet Sauvignon or the local varietal known as Fer Servadou soften it and help make it more drinkable, especially in its youth. After a few years time it becomes incredibly smooth and supple and this wine was showing well already. Newer winery techniques such as micro-oxygenization lend additional aid in the softening process as does oak maturation. The structure and elegance of these wines can easily stand up to their Bordeaux cousins, and some of the most famous fetch similar prices. While this is the original and most famous region for Tannat, it is now finding great success in Uruguay, similar to that of Malbec in Argentina. 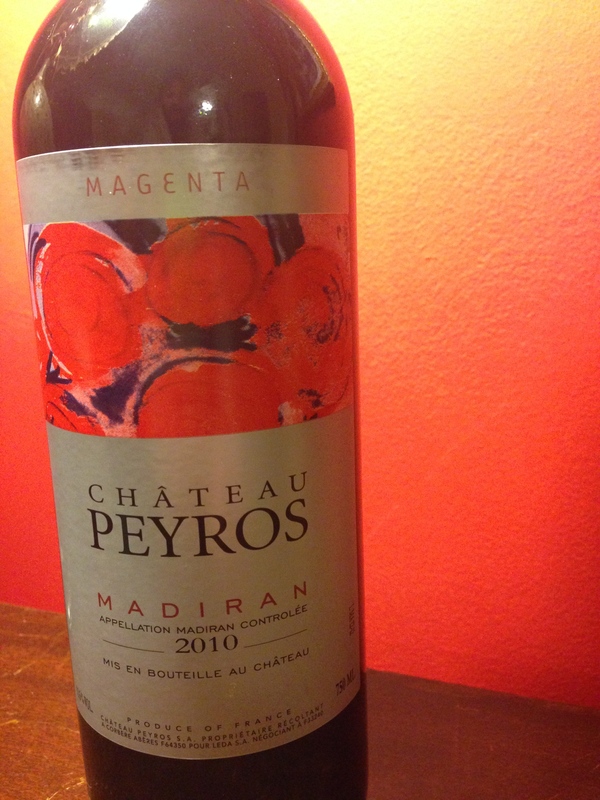 This 2010 Chateau Peyros “Magenta” is a 50-50 blend of Tannat and Cabernet Franc and on the palate also strikes a perfect balance of structure and fruit — blackberry, plum and cherry primarily. The name is derived from the purplish hue of the blend. It also has a nice amount of baking spice, hints of smoke and an earthy, almost gamey note as well. A lasting finish included additional hints of spice that lingered on. Typical age before drinking is recommended at 4-8 years, so at five years old, this beauty was ready to drink. It’s also extremely affordable. I don’t know the price paid as it was a gift, but from a quick online search it looks like you can get them from $11-14. Suggested food pairings are pork and lamb, or a fatty cheese like Roquefort — the fat easily cut through by the firm tannins. So we prepared braised pork chops with a dijon glaze and a spicy pilaf and it was a match made in heaven. At work, our team Italian wine expert is my colleague Stephen. Whereas I’m more the French and American wines geek, he knows his Italian wines — especially the Brunello. Today we are talking about another Sangiovese-based Italian classic. Chianti Classico means it is made in the ‘classic’ or original historic region of production. Located within central Tuscany, the region of Chianti is larger now, with several other sub-regions including Chianti Rufina and Chianti Colli Senesi. 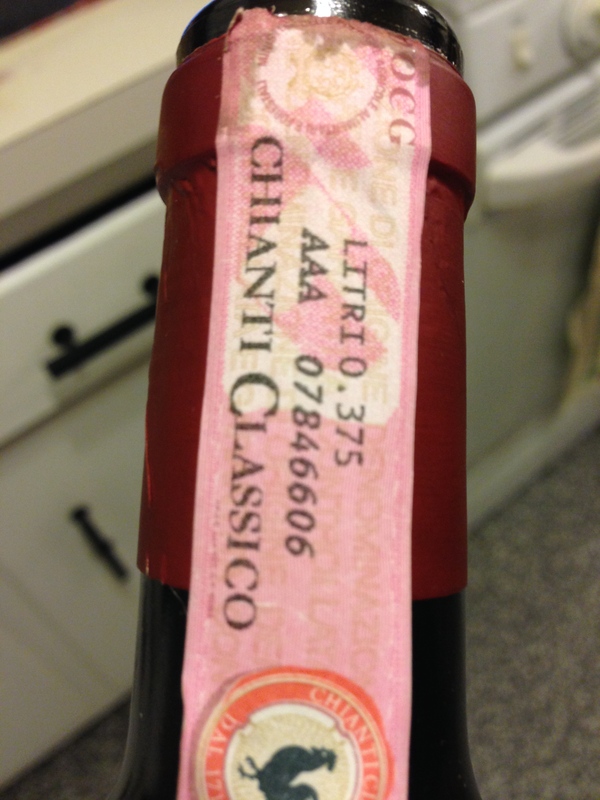 And only the Classico region can have the famous black rooster symbol on the neck of the bottle (see second photo), indicating the producer is part of the Chianti Classico consortium. This consortium focuses on improving the quality and integrity of the wines. Originally known for the straw-basket bottles called fiascos (a few producers still bottle it in those), Chianti DOCG is Italy’s most exported red wine. It is a region with many centuries-old vineyards. They are typically aged in oak – botte or the French barriques. This wine is aged in the French oak for 12 months, and their grapes are all organically grown. Chianti is primarily Sangiovese, but up to 20% can be other varietals, usually local ones like Caniaolo and Colorino. In the earliest forms of Chianti, there were even white grapes like Malvasia Bianca and Trebbiano allowed. Sangiovese wines give you a good amount of acidity and tannin, so the blending of other varietals makes it a bit less astringent. 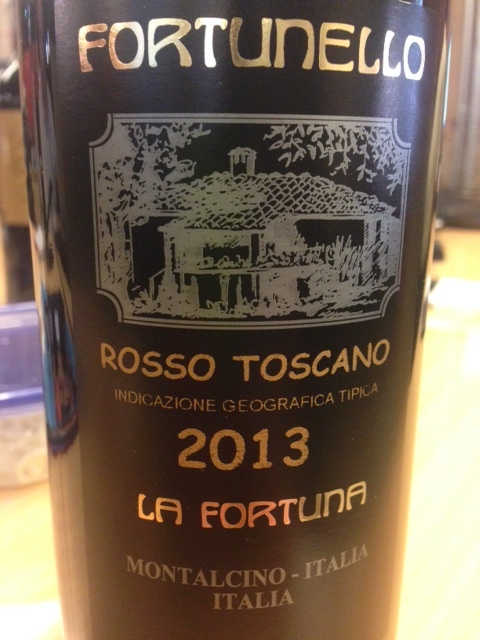 While this is 100% Sangiovese, it is sufficiently mellowed at this age. On to the Fontodi story… So Steve had promised me a nice bottle of wine if I completed all my goals for the month, and I did. Well, about a month later, or was it two, I finally did get that gift. And what a great one it was. So, while I like to tease him for how long it took to get to me, I am really thrilled he gave it to me. I shared it with another one of our colleagues that very night. 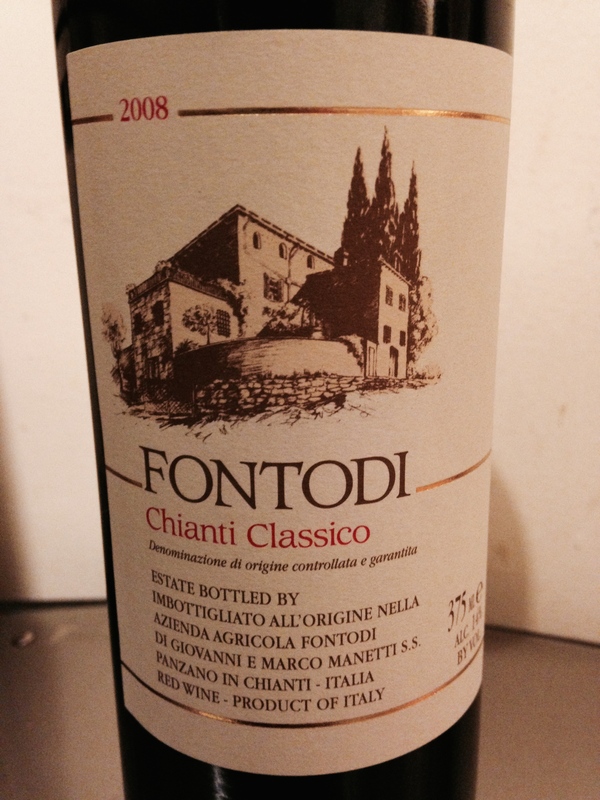 2008 was a great vintage in the region, and Fontodi is one fantastic Chianti. After all, this is a wine and vintage that James Suckling gave 93 points, and got 90 points from Parker’s Wine Spectator. They are one of the current stars of the region. On the nose, there’s intense black cherry, cocoa, plum and vanilla notes. On the palate it has deep, complex berry notes, spicy toast aromas from the oak, black pepper and a tobacco element as well. It was a tasty, tasty wine and between the two of us, did not last long. Salute!